If you are experiencing the cool breezes of fall and the pretty color changes of the leaves, please tell me about it in a comment. Go ahead! Brag! I REALLY would love to read about it. 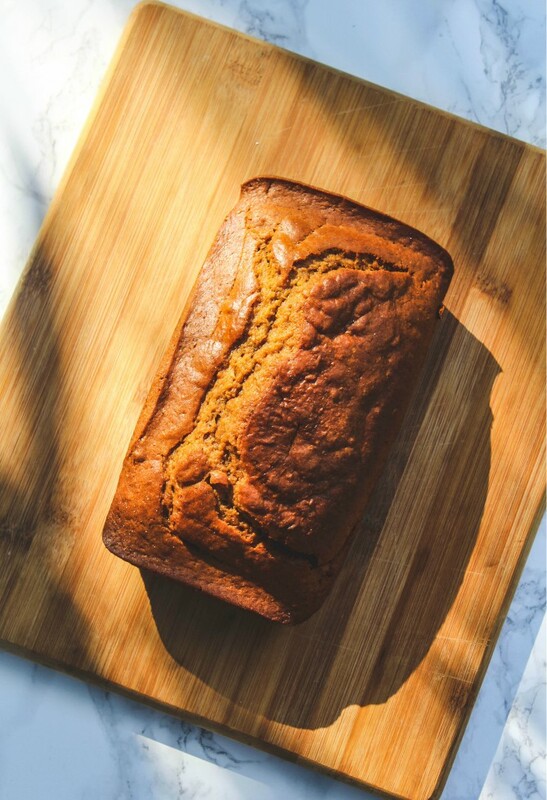 I’m dreaming about fall breezes and leaves changing every time I take a bite of this amazing Pumpkin Bread. You see that pretty, bright sunny background behind the pumpkin bread? It’s hard to believe it’s already fall! It doesn’t look like fall here. But while I’m tasting a bite of this bread full of fall’s spices, I close my eyes and can feel a gentle cool breeze caressing my cheeks. Ok, it’s just my air conditioning hitting me in the face. I envy you people that have the four seasons to enjoy! I sometimes make my pumpkin bread with butter. Here’s a link to the recipe with butter if that is more your style. I never believed I would say I love this recipe better than my butter-loaded one. But I honestly do! It’s moist and quite addictive.The beauty of this recipe is that it’s for 2 breads! And this recipe is totally VEGAN. When you have one child that has dairy intolerance and one child that loves dairy, you sometimes bake dairy free. This Pumpkin Bread is totally dairy free. CAN I MAKE A PUMPKIN BREAD WITH A HALLOWEEN CARVING PUMPKIN? It’s best to use the large carving and decorative pumpkin for just that, carving and decorating. They’re not meant to be roasted or steamed to get the puree. Although I do have friends that have used carving pumpkins to bake and cook with. You would get better results for this bread using a sugar pumpkin, butternut squash or kabocha pumpkin for puree. I used canned pumpkin for this bread and that’s what I usually do. HOW TO MAKE PUMPKIN BREAD? You could adapt this recipe to using your favorite spices and also the amount of spices. I use a little extra of the cinnamon, as I like a more prominent cinnamon flavor. Also, you could use your favorite pumpkin for the puree. This recipe happens to be vegan and it’s one I found on Joy the Baker a very long time ago and I’ve made my own adaptations. You could use melted butter instead of vegetable if you don’t want to have a vegan bread. You could also use coconut oil instead of vegetable oil. I like to make my own brown sugar for this bread with molasses and granulated sugar. I love the malty flavor of the molasses. If you don’t have apple cider vinegar to add to the almond milk, it’s fine without it. It will still be a very moist pumpkin bread. HOW TO MAKE A GLUTEN-FREE PUMPKIN BREAD? I usually make one loaf plain and one loaf with semi-sweet chocolate chips tossed in the batter. I was very distracted taking the photos of the bread from the tempting scent of cinnamon and ginger. I had to have just one more slice. My second of the day so far. It is SO good! Keep one loaf for yourself, and give one to your favorite friend or neighbor or teacher. They will be so very grateful. 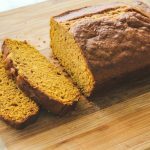 Fall baking means it's pumpkin season and this is the BEST pumpkin bread! 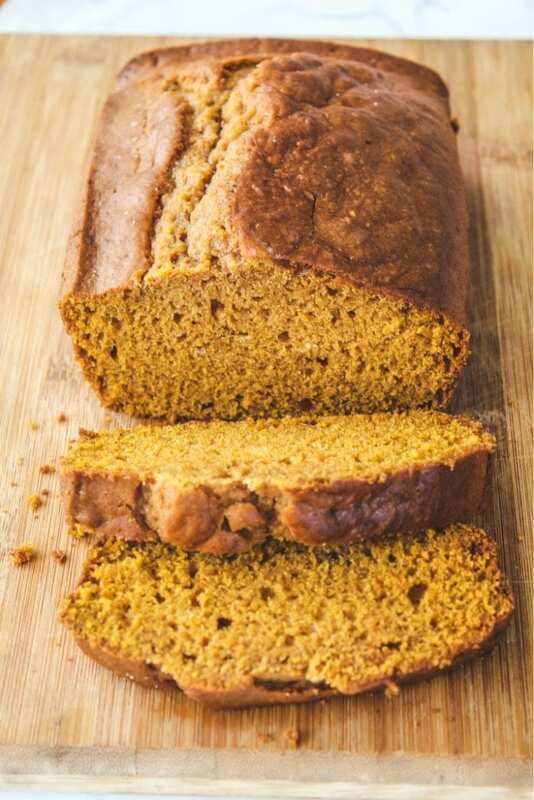 This super moist pumpkin bread is spiced with cinnamon, ginger, nutmeg and molasses. Preheat oven to 350 degrees F. Place a rack in the center of the oven. Line two loaf pans (mine are 9 x 5) with parchment paper and set aside. Spray the pans with baking spray (or grease and flour the pans). Pour the rice milk (or almond milk) into a small bowl and add the apple cider vinegar. Stir it together a little and let it sit for minute while you prep the other ingredients. In a large mixing bowl, whisk together flours, baking soda, baking powder, salt and spices. In a very large bowl, stir together pumpkin puree, oil, orange juice, and rice (or almond) milk until nicely combined. Add the dry ingredients to the wet ingredients about a cup at a time. Stir well after adding each cup of the dry ingredients using a spatula to scrape the sides of the bowl and incorporate it all together. Spoon the batter into your parchment lined loaf pans and smooth down a little with a spatula. Bake for 1/2 on hour at 350 then lower the heat to 325 and bake for about another 30-40 minutes, or until a skewer inserted in the center comes out clean. It will be hard to wait for the bread to cool before serving. Surprise a friend or a neighbor and wrap the 2nd loaf to give as a gift. You will be thanked profusely. Looks wonderful- have to try it! Oh..love the supple, light and wonderful flavored loaf! Need to try rice milk baking. And what a lovely way to preserve memories, Lora. Both of my kids adore pumpkin, especially Liv. This would be a perfect snack before dance rehearsals! With you having it for 3 weeks straight it must be good. That's all I need to hear! I will definitely need to to try this. It is hard to believe that there are no eggs or butter in the recipe. The end result looks awesome, I am glad you posted this! Love this bread and I find it so challenging to make a vegan version so am pretty impressed!! Honestly even straight forward zucchini, pumpkin any gourds and squashes loaves I am terrible at but always taste so good when someone else makes it. Hint! Hint! This looks so amazing! Perfectly moist and delectable! I adore finding new recipes like this, and this is one I can make for my Sister In Law since she is dairy-free! Your bread looks so moist and inviting, perfect with a cup of coffee or tea. I'm always looking for healthier recipes, now. Welcome Fall! Love this and having it with morning coffee sounds like a great idea! Any kind of pumpkin bread is good pumpkin bread. The oil is what makes it so moist. I'm ready for fall. Sorry about your friends too, too much bad new lately. Will keep them in mine. Good news is, I can't wait to meet your mom, it's gonna be so fun. Hope you have a great week. I'm giddy about pumpkin season. Bring it ON! We are so so so on the same page; I could eat a slice of cake/bread for breakfast with my coffee everyday of my life and die a happy woman. This looks great – I can't believe it's vegan! I tried this yesterday and it came out really yummy. Sweetness was perfect. I used baked pumkin puree so it was fairly dry so I added ½ cup milk. What should be consistency of batter? Hi-I'm happy you liked the flavor and sweetness. As for the consistency, I use canned pumpkin and it is always very moist. The consistency of the batter is creamy and dreamy:)Maybe you could try the next one with canned pumpkin? :)Thanks for stopping by!! that looks delicious! I also love Trader Joe's pumpkin bread. YUM! I just happened upon your blog and this recipe when I was looking for something to bring to vegan friends for Thanksgiving. Easy to make and bring along I decided to give it a try. And what a treat! I actually substituted the rice milk for Silk Pumpkin Spice soy milk since I happened to have it on hand (and no time to run to the supermarket). Moist and flavorful, even as a non-vegan this was delicious and a huge hit at the Thanksgiving table! I will definitely be making this recipe again and again. I have this baking in the oven right now and it smells great! The batter was delicious! I couldn't believe how much it made, I had to use a pot to mix it because I didn't have a big enough bowl! I used homemade pumpkin puree and So Delicious coconut milk and it worked great. Thanks for the recipe! Mmm! Love this Lora, it sounds delicious! I am so ready for pumpkin desserts and fall! FYI the recipe isn't vegan……. There is no butter, eggs or dairy milk. Can you elaborate why? Love this recipe! Thank you for sharing with us! Loved this recipe! My son has dairy and egg allergies, so I'm always looking for great recipes like this to treat my family once in awhile. Good thing I made two loaves this morning because my 18 month old, hubby, and FIL already gobbled up one of them. I was initially unsure about the OJ but turned out wonderful, followed the recipe exactly. Thanks for sharing! !